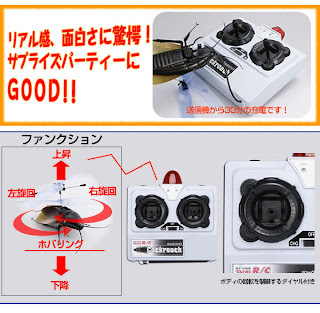 A Rinkya Blog: Meanest Prank Gadget EVER! 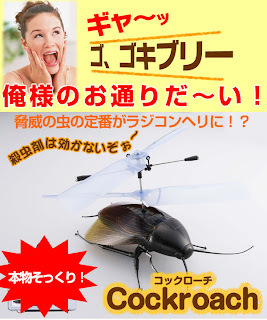 A HUGE flying remote controlled cockroach! Yeah, it is obvious it looks like a big huge plastic thing but if this came at me I would run away screaming! Shiso Pepsi Reviews Are In!! World Cup USBs- Remove Heads for Storage! Official US Ponyo On A Cliff Trailer! Vending Machine Must Haves in Japan! A Scrap Booker's Must Have! Japan Likes Their Piggy Banks Fancy! I Have Found Your New Broom! Rinkya Collector's Corner- Murray's MIJ Guitars!! Eye Masks to Scare Your Partner! Rinkya on the Japan Podshow! Everything You Need to Make Taiyaki! Listen, Read & Watch At Japan Podshow! !